Despite the Hungarian Grand Prix taking place just before the summer break, F1 teams continued their relentless development, revealing another swathe of technical updates. Budapest is one of the best tracks on which to introduce and understand new parts – it is not an outlier like Monza or Baku, there are mixture of corner speeds, and good weather is all but guaranteed. All these factors resulted in improvements being brought to multiple cars. Sauber introduced the first part of its second major aerodynamic update of the season in Hungary, but as with the first package, it failed to lift the team into the midfield. The most significant development was to the cooling system, which finally allowed the team to run its year-old Ferrari power unit at full power in qualifying. Furthermore, the bargeboards were revised, with five vertical slots being introduced. The result of this is improved airflow attachment thanks to smaller chord curved surfaces as well the ability for airflow to pass through the slots and energise the inboard boundary layer. Detached flow leads to a significant rise in pressure drag and this would reduce the efficiency of the bargeboards. Considering that Sauber is running an old power unit, this type of development is key to its chances of scoring more points this season. Segmenting the bargeboards also allows a series of targeted vortices to be shed at the trailing edge of each mini-element, improving the ability of the car to deal with the front tyre wake, and direct it outboard of the back of the car, including the rear tyre. Also in this area of the car, the mirror mountings were revised for the second time this season. 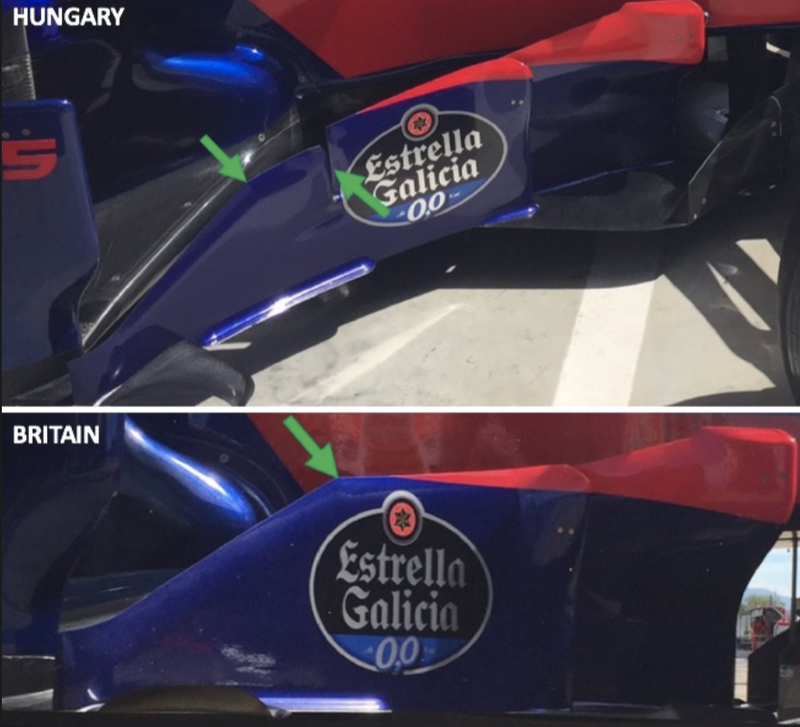 The actual positioning of the mirrors compared to the rear wing and cockpit protection is largely unchanged, so the change was probably aimed at minimising the disruption of the mirror stalks to the incoming flow, which has been achieved by reducing their size. Additionally, the sidepod air intake is no longer triangular, but more rounded. It is also narrower, visible from the side crash protection sticking out from the sidepod. Overall the intake size is similar, so this alteration will not affect cooling performance, but the narrower sidepods will encourage airflow to remain attached to them through the coke bottle section, keeping pressure drag low. Renault has made significant strides over the last two races, performing strongly on two very different tracks. The major development in this upward trend was a new floor and diffuser at Silverstone. For Hungary, a new front wing was tried during FP3, but then discarded for qualifying as the team needed more time to balance it with the rest of the car. 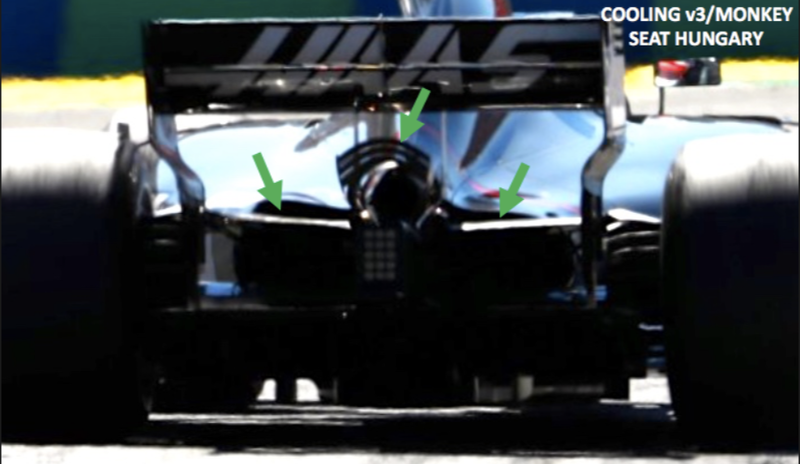 The major change concerns the endplate, with the longer canard being placed lower down and with greater curvature. This new part will shed a stronger vortex, which will then be collected by the airflow directed outboard by endplate, and travel around the front tyre. As it travels outboard, before passing by the tyre, the vortex will collect more airflow that would otherwise collide with the wheel, lowering drag and turbulence further. 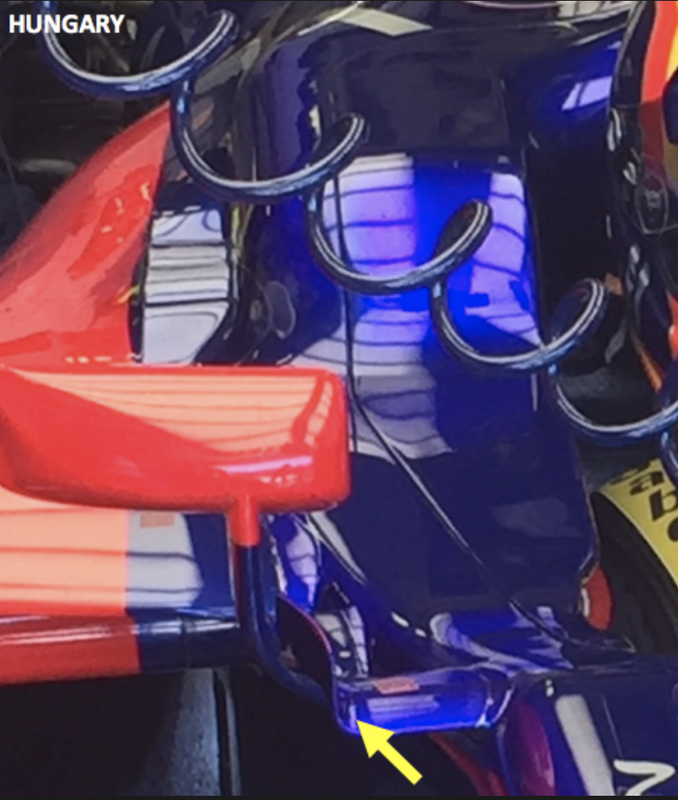 The fin at the top of the endplate has been removed, with the longer canard proving sufficient, along with the cascade fins and endplate, to improve airflow around the front tyre. Using the fin, which sheds a vortex, would produce a net laptime penalty. Changes were also made to the cascade set-up of the wing, with the leading edges of the vertical vanes all being rounded. A front-on view of the new versus the old wing provides a further insight into the differences between the two wings. Firstly, the main cascade elements are a little wider than previously, a change aimed at directing more airflow over the front tyre, for lower turbulence and drag. Meanwhile, the fin sitting in the centre of the cascade has been extended further outboard, increasing the pressure differential either side of it, the result of which will be a stronger vortex shed at the back of the part. This will enhance the ability of the vertical fins to pull more air around the front tyre that would otherwise collide with the wheel. The larger fins, one attached to the cascade and the other standalone, were also re-profiled to optimise the flow around the tyre. Toro Rosso introduced its second significant aerodynamic update of the season in Hungary, having been quiet on the development front for much of the year. As expected, the team went well in Budapest, thanks to the low dependency on straightline speed helping what is a ‘draggy’ car with an under-powered engine. However, the fact that midfield rival Renault was far quicker in qualifying trim will be of concern on one of STR’s best tracks. The bargeboards were revised, with the main difference being the introduction of a vertical slot halfway along the second element, improving the attachment of airflow to the inboard side of the part. This philosophy is the same as that used by Sauber (mentioned above), albeit on a smaller scale. With more attached flow, the ability of the bargeboard to direct as much airflow as possible outboard to divert the front tyre wake is enhanced. 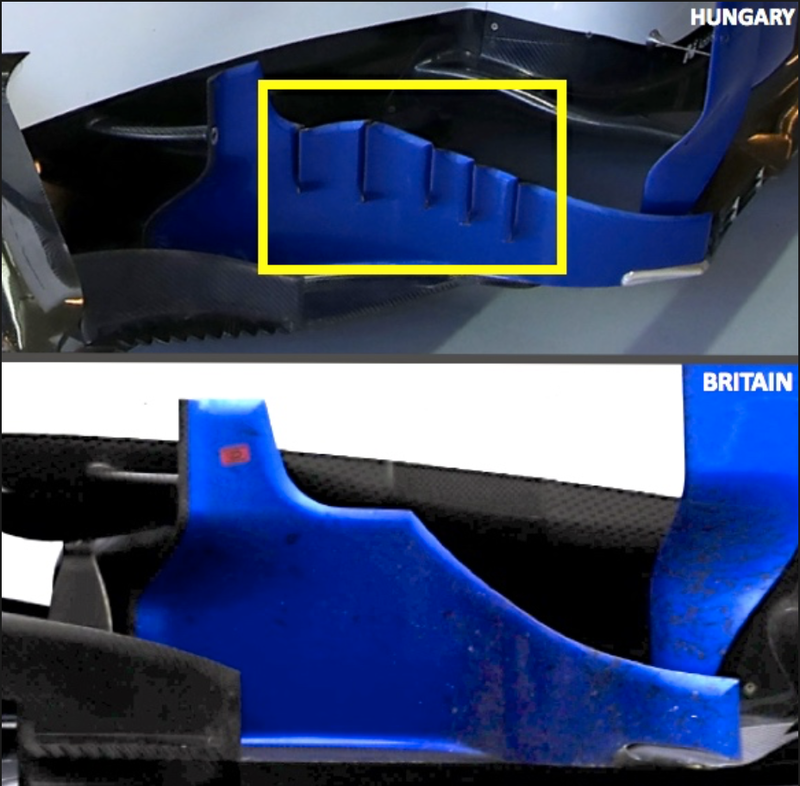 Additionally, the step change in slope along the second bargeboard element has been moved further back along the part, while there is also a step in the bargeboard height either side of the new slot. Lastly, a pair of cockpit fins have been added either side of the survival cell, just forward of the wing mirrors mounts. The major effect of these fins arises from their vertical parts, which are sculpted noticeably outboard. They will direct air away from the bulky cockpit sides that sit further back, reducing turbulence as air travels towards the rear wing. Haas has generally been quiet on the development front in recent races, save for an upgrade in Baku, and this was the case again in Hungary. Nevertheless, the American team has kept pace with its midfield rivals this year – this may be because the team is still new, and hence there are gains to be made from understanding the car and set-up options, improvements that established teams would have made more quickly. 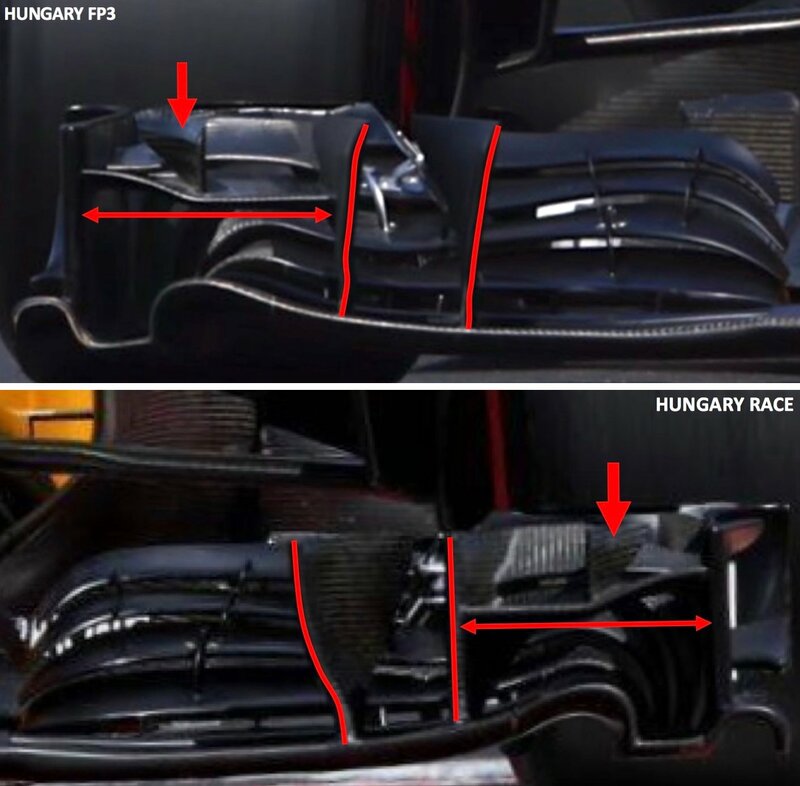 For Hungary, the team used the asymmetric cooling set-up it first introduced in Baku, where, looking from the rear, the left outlet is noticeably larger than the right one. This is not an uncommon concept, with Toro Rosso using it in recent years. The reason for this configuration is that there are more temperature critical components in one sidepod than the other. Opening up the outlet ensures these parts are less confined, reducing the likelihood of overheating. Note that the right outlet is taken from another cooling configuration. The performance loss from enlarging the engine cover is not particularly significant, but there will be a small rise in skin friction drag. Additionally, the team altered its double monkey seat set-up, once again copying one of Ferrari’s design. There was a minor change to the winglet around the exhaust, while three, as opposed to two elements now make up the rearward monkey seat. Also note that the positioning of both winglets is unchanged. The angle of attack of the rear winglet is greater than that of the old version, meaning the plume will be directed upwards more aggressively and energise the rear wing’s lower boundary layer a little further forward, as the team looks to maximise downforce consistency by minimising airflow detachment.